An inkjet print on an extra-large cloth developed from a video still of the same project. 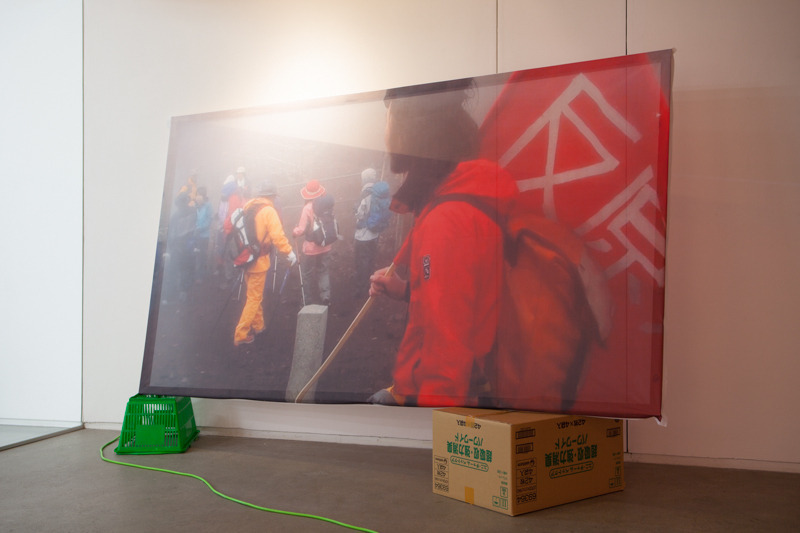 Through printing the image at a scale “larger than life”, the image is degraded, eliminating its photographic aesthetic and instead emphasizes the meaning of the action itself. Using the translucency of the cloth, this work was installed in the exhibition space in a way that the shadow of the frame, which secures the photograph in place, shows through and overlaps the image while refraining from making the frame level. This shadow on the image seems to show the real horizon, though it is left deliberately ambiguous as to whether this is the horizon which was actually visible at the site of the performance or just a shadow of the frame – expressing the indeterminacy of the environment surrounding us.